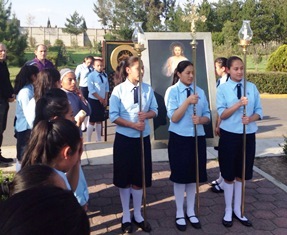 On arrival to the Girls Town in Valle de Chalco, the holy image first made a 1 km tur on the grounds connecting 6 buildings where 3,000 girls from all over Mexican Republic, live. 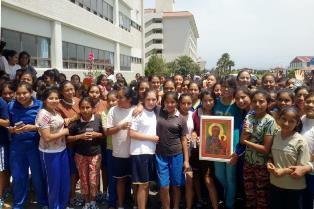 Girls formed a human alley that began on the sidewalk where the vehicle was parked, so Our Lady in her icon was carried on the shoulders of some of the best students under the direction of Daughters of Mary. They welcomed Our Lady while singing hymns dedicated to Divine Mercy. After procession from “street” to the main gymnasium, the image was placed right in the middle and in front of the 3,000 girls perfectly seated. This place has wooden floor and is the only space with roof able to receive together all the interns of technical, secondary and high schools. This institution receives young women, the girls of high vulnerability situations, coming from the most remote areas and greatest poverty in the country to complete their high school. Therefore, every year a national team attending analyzing several factors identify those who should benefit from this charity. 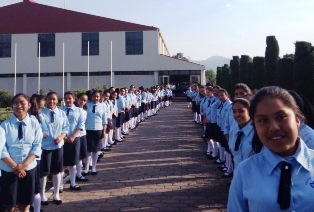 Villa de las Niñas (Girls Town) has been founded by Fr. Alosyous Schwartz in Korea in the late 70's. In the 80´s they arrived in México. On April 25th we celebrate the anniversary of this amazing institution which with daily and silent work do admirable serves to so many families in need. VidaFlorida Foundation delegation, José Luis & Beatriz along with their young children and other families that joined the event, spoke about Defense of life. Particularly they talked about sanctity of life, explaining to the girls at which time conception occurs. They told them that if at some future point in their life away from school, any of them would face unexpected pregnancy, be sure to make a stop to reflect in order to overcome loneliness and seek help in institutions available for these purposes. The family spoke for 40 minutes and subsequently chosen girls climbed to the podium to carry the image with the Polish Virgin in singing procession up the stairs toward the 7th. floor of one of the 3 buildings where bedrooms are and to the chapel for 24 hours. In each building 1,000 interns live. The next day Our Lady was transferred to the next building and so on. Holy Icon remained with them until Good Friday. 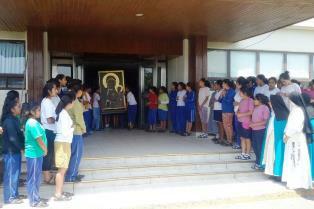 By noon that day, the Icon together with the image of Our Lord of Divine Mercy were picked up and taken to the Convent of the Contemplative Sisters of the Immaculate Conception of St. Beatriz de Silva in Juchitepec, another nearby town.